DODGY recently released a brand new version of their Top 20 smash ‘Staying Out For The Summer’ to raise money for the homeless. The legendary Britpop band re-recorded the song and gifted it to Musicians Against Homelessness (MAH). The band also made a new video to promote the song – a summer hit in both 1994 and 1995, and originally a track on their seminal second album Homegrown which went gold in the UK. 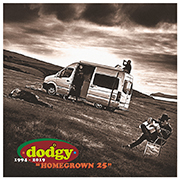 Dodgy are playing their album Homegrown in full plus other hits on a huge UK tour in Spring 2019 to celebrate the 25th anniversary of the release of their breakthrough, gold-selling second album. They will be supported on the tour by Babybird and Tony Wright (Terrorvision). Dodgy notched up nine Top 40 hits in the mid-90s including the Top 4 smash Good Enough – one of the most played tracks on British radio in the last 20 years. Their third album, Free Peace Sweet, the follow-up to Homegrown, went platinum. In the seven years before their first break-up, Dodgy sold more than one million records. They played a Saturday evening slot on the Pyramid stage at Glastonbury Festival in 1997 just before Radiohead.